Union Square Press, 9781402767487, 520pp. Everyone knows the iconic news photo of jubilant underdog Harry Truman brandishing a copy of the Chicago Tribune proclaiming "DEWEY DEFEATS TRUMAN." David Pietrusza goes backstage to explain how it happened, placing the brutal political battle in the context of an erupting Cold War and America's exploding storms over civil rights and domestic communism. 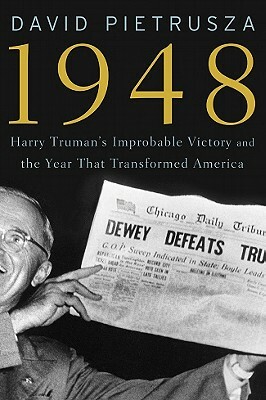 Pietrusza achieves for 1948's presidential race what he previously did in his acclaimed 1960--LBJ vs. JFK vs. Nixon bringing history to life and intrigue readers with tales of high drama while simultaneously presenting the issues, personalities, and controversies of this pivotal era with laser-like clarity. David Pietrusza, is the author of 1960--LBJ vs. JFK vs. Nixon: The Epic Campaign That Forged Three Presidencies; 1920: The Year of the Six Presidents; and Rothstein: The Life, Times and Murder of the Criminal Genius Who Fixed the 1919 World Series.